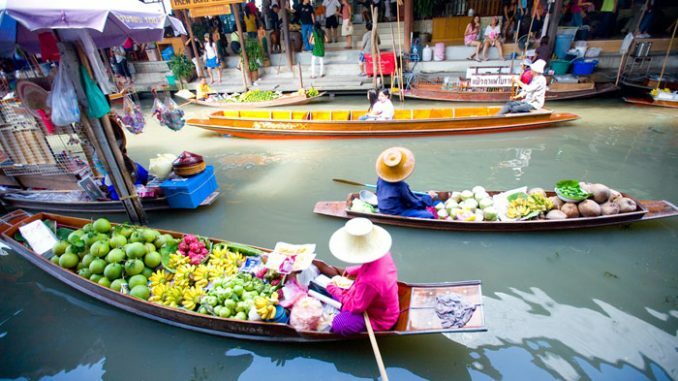 The Pattaya floating market, also known as the Four Regions Market, is a modern recreation of the more familiar and traditional floating markets. Built and opened recently it does not pretend to be original rather instead it aims to showcase the different cultures and traditions found around the four corners of Thailand. The floating market is spread out across 100,000m2 of land, and its four distinct sections are easily recognisable. Inside the market there over 120 stalls and shops segregated in to the different areas, and showcasing traditional arts and crafts from their respective region of Thailand. Goods on offer here are traditional hand crafted pieces and are generally of a much better quality than found elsewhere around Pattaya. As such prices are also higher inside the market. If you are looking for some quality authentic pieces to take home and treasure as a reminder of your travels you will do well here. Visitors can walk around freely between the zones at their own leisure and the huts are fairly close to each other meaning lots of shade and cool air. There is no need to rush when here and stopping and talking to the individual stall holders is a great and informal way to learn more about the Thai culture and traditions. The stall holders are really knowledgeable and most are willing to chat and showcase their culture. As this is called Pattaya Floating Market, I suppose it would also be a good idea to hire one of the small man powered boats. Known as the gondolas of the East, these are really enjoyable and relaxing way to see the market. Boats can take a family of 4 easily and for a small fee which seems to depend on how busy they are, will take you on a tour of the market which lasts around 30min. This is a great photo opportunity. 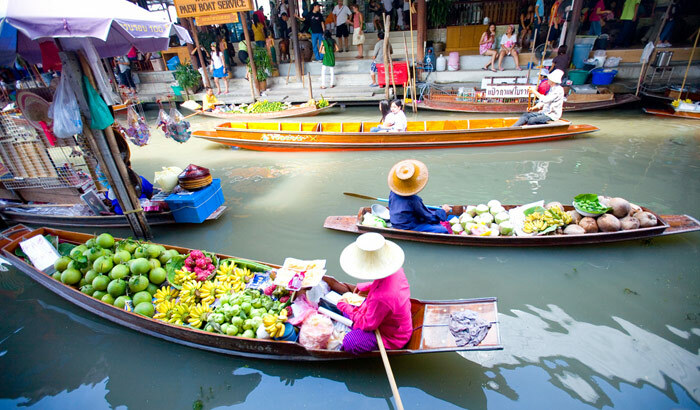 As well as showcasing arts and crafts from the different regions, the floating market also boasts the different cuisines and foods found across Thailand. In fact this is one of the main reasons it is so popular with expats and the many migrant Thai workers who now live in Pattaya. Food is slightly more expensive than at food carts found around Thailand, but is still extremely reasonable when compared to the cost of eating out back home. A Thai meal with water will cost around 120thb-180thb ($4-6US). The floating market is also home to a cultural show every afternoon which shows the differences between the four corners of Thailand. Located along Sukhumvit highway towards Na Jomtien, the floating market can easily be reached by the white baht bus route which runs regularly along Sukhumvit road. Those with their own transport can easily park at the back of the market. There are also regular tours visiting the market, however we find these a little rigid on timings and lacking in freedom. The market is open daily from 10:00 until 23:00 and there is a small entrance of 200thb payable at the gate. Although Thai nationals and expats with valid work permit or Thai driving licence are admitted free of charge. The 200thb entrance fee allows you access to the market and the cultural show. Tickets are valid for returning visits within the stated time. Meaning if a few days later find yourself wishing you had bought a certain item you can always nip back and get it without paying to enter again. 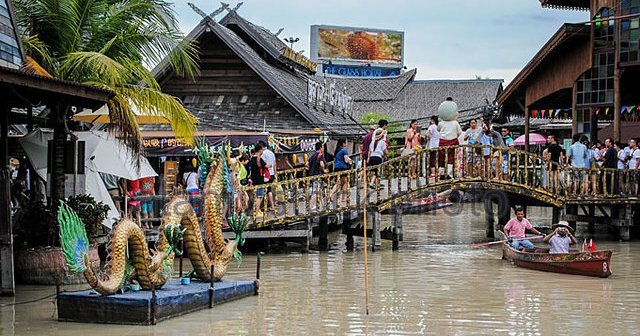 Overall Pattaya floating market is a great attraction especially for those who won’t get the chance to visit on the real floating markets. It is also great for families and the kids will love the boat trip around the market as well as the cultural shows. If you looking for quality gifts or souvenirs to take back home then the quality here is great. Book your trip to the Floating Market now.